Time to share with you one of this years finishes – a project which was certainly a labour of love over 12 or so months! 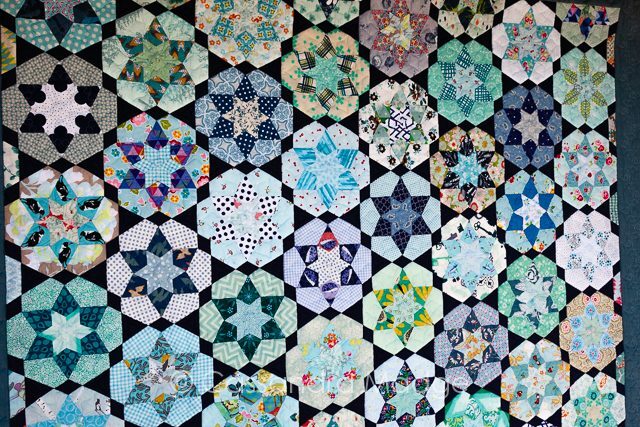 This English Paper Pieced project was a block of the month from the talented Australian designer Jodi, at Tales of Cloth, called Ice Cream Soda. 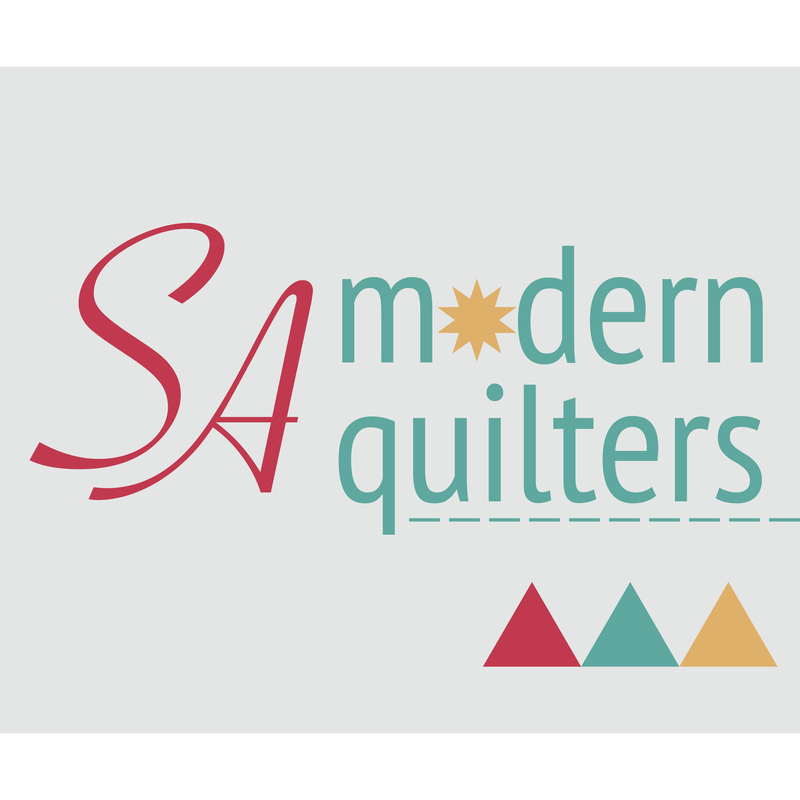 An excellent, quick growing quilt and comfortably pieced within 12 months. 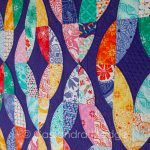 It’s an ideal pattern for a new EPP quilter, as the pieces are all a good size and no tricky components such as curved edges. As you can see, the basis for the pattern is two 6 pointed stars, with surrounding crown pieces, joined together with triangles and diamonds. Because the pattern was so straightforward, I challenged myself with my fabric selections – the larger star had to be a darker print than the inner and outer layers. 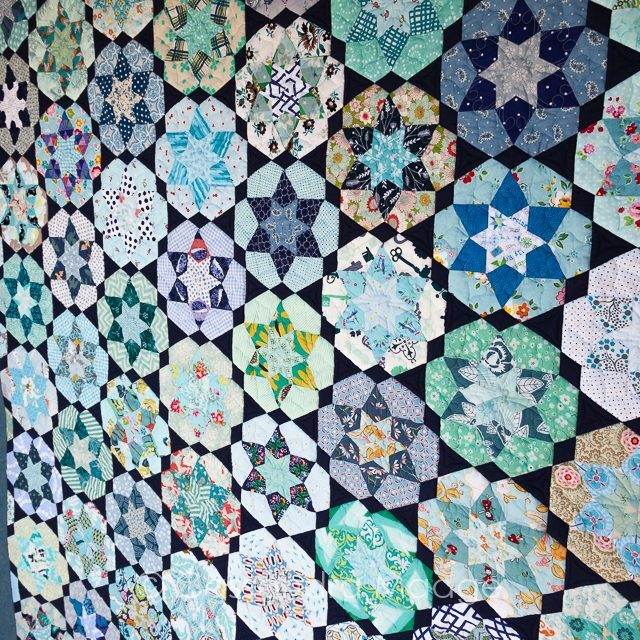 Also, the entire quilt was made out of fabrics in the blue/aqua/jade/mint families – seaglass colours was my description. 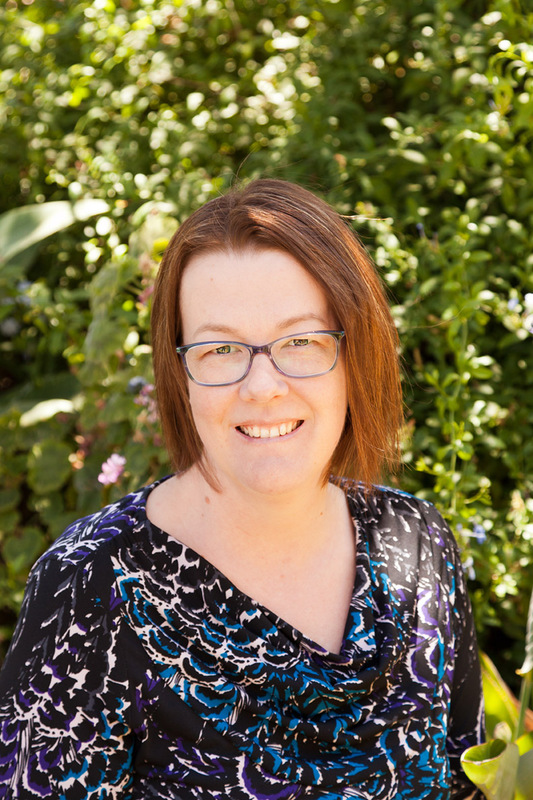 None of the darker stars fabrics are repeated, and all the other fabrics only appear once in each shape – an inner ring and outer ring, but never again. As a result, I now have a very VERY extensive blue fabric stash!! 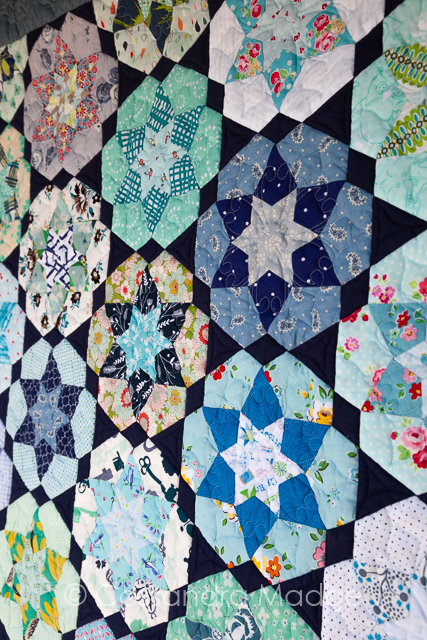 When we were laying out the blocks, we tried to spread out the different hues, as well as the prints with extra colours in them, so as to give the quilt visual interest and encourage the eye to roam across. A very dark navy was my selection for the background pieces, to give depth and allow the blocks to pop away from the dark shapes. 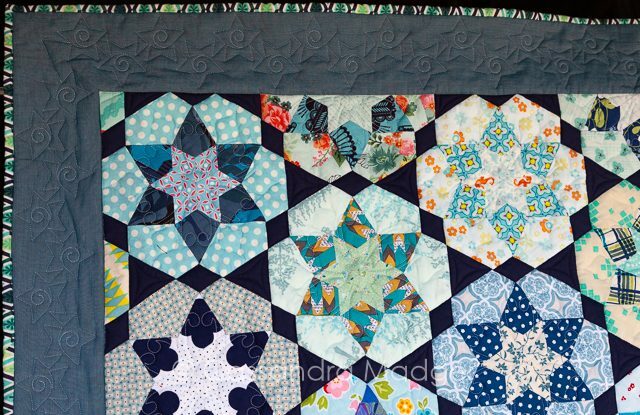 The border was a blue shot cotton, which I quilted with a simple linked star edge to edge design. The final touch was the Tula Pink binding, cut lengthwise to add spiky partial star lines radiating out from the quilt. The quilt was double batted, so it’s very heavy and warm, with great natural puff. 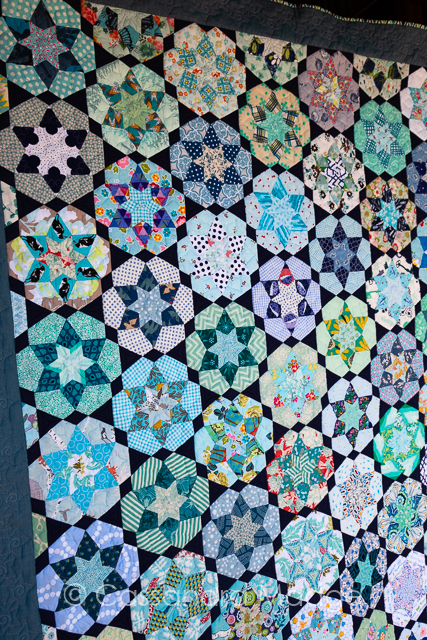 Each block was individually quilted with a 6 sided star/flower motif. The background shapes were stitched around to isolate the blocks, and the large navy background triangles also had a simple curve added to each side. Unfortunately the lighting was very challenging photographing this quilt, which ranges from very dark navy to white prints. The quilting detail is hard to pick up, but hopefully you can see enough of it. 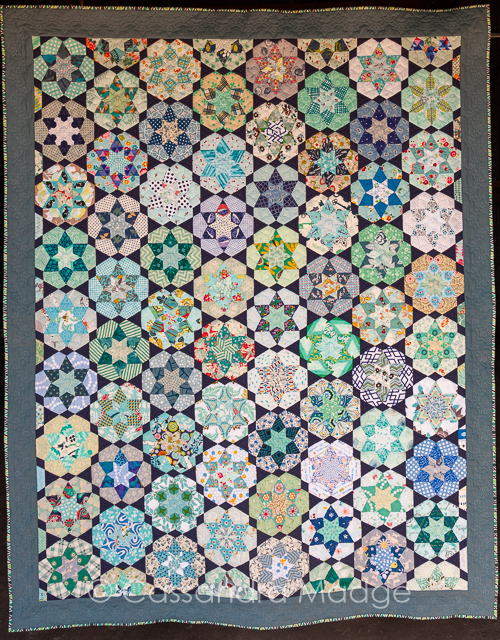 This type of custom quilting is fabulous for EPP quilts which feature many blocks, often odd shapes and broken up by background piecing. 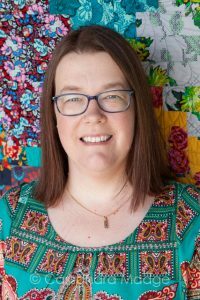 If you are interested in talking to me about your quilting needs, you can see my portfolio and contact details at Juicy Quilting. I am so happy to share that this My Milky Way won second prize in the Royal Adelaide Show “Star Quilts” category for 2018. 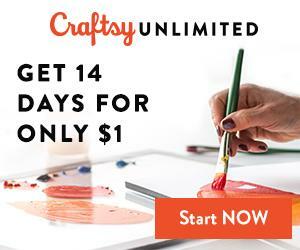 What a beautiful quilt and so labor-intensive. I’m not at all surprised you won a prize with this. Congratulations! Beautiful quilt. One of a few that I’ve seen with double batting. 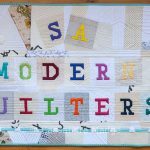 I finally finished a triple-batted quilt. 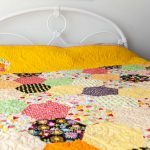 I hand quilted it over 15 years!live the care you took in selecting the larger star placement.